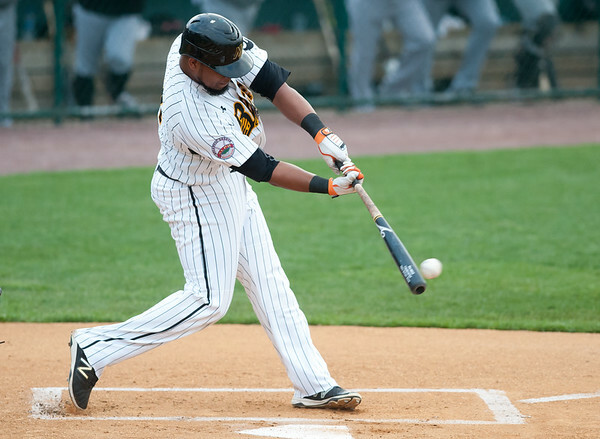 NEW BRITAIN - It was not the series the New Britain Bees were hoping for to open the second half of the season, but the Bees are heading on the road on a small high note. Five different players drove in a run and the bullpen threw four innings of quality ball to help New Britain salvage the final game of its three-game set against the Southern Maryland Blue Crabs 6-5 Sunday afternoon. It just wasn’t easy. The Blue Crabs scored the final five runs of the day, scoring their first three off Bees starter Kyle Simon in the top of the fifth. Devon Rodriguez hit a home run to put Southern Maryland on the board with Ryan Strausborger’s sacrifice fly bringing the next run four batters later. Teodoro Martinez’s two-out single scored former New Britain designated hitter Craig Maddox to put the score at 5-3. It was Simon’s last inning. The right-hander gave up three runs and six hits and walked two, earning the win. The Blue Crabs tacked on another run in the sixth when Frank Martinez scored on an error by Bees catcher Ryan Wagner and their final run in the eighth off a wild pitch from newly-signed Brandon Cunniff. But New Britain’s offense was able to provide enough runs for Simon and the rest of the pitching staff from the start. Deibinson Romero’s sacrifice fly put the Bees up 1-0 in the first. Ozney Guillen and Vinny Siena hit back-to-back singles to bring in two runs in the second inning with Jonathan Galvez scoring on an error on Guillen’s hit. Brock Stassi’s home run for in the third and Wagner’s two-run homer in the fourth capped off New Britain’s scoring for the afternoon. Posted in New Britain Herald, New Britain Bees on Sunday, 15 July 2018 21:23. Updated: Sunday, 15 July 2018 21:25.